The chief god of the Blackfeet is the Sun. He made the world and rules it, and to him the people pray. One of his names is Napi—old man; but there is another Napi who is very different from the Sun, and instead of being great, wise, and wonderful, is foolish, mean, and contemptible. We shall hear about him further on. Every year in summer, about the time the berries ripen, the Blackfeet used to hold the great festival and sacrifice which we call the ceremony of the Medicine Lodge. This was a time of happy meetings, of feasting, of giving presents; but besides this rejoicing, those men who wished to have good-luck in whatever they might undertake tried to prove their prayers sincere by sacrificing their bodies, torturing themselves in ways that caused great suffering. In ancient times, s we are told in books of history, things like that used to happen among many peoples all over the world. It was the law that the building of the Medicine Lodge must always be pledged by a good woman. If a woman had a son or a husband away at war and feared that he was in danger, or if she had a child that was sick and might die, she might pray for the safety of the one she loved, and promise that if he returned or recovered she would build a Medicine Lodge. This pledge was made in a loud voice, publicly, in open air, so that all might know the promise had been made. In the earliest times there was a man who had a very beautiful daughter. Many young men wished to marry her, but whenever she was asked she shook her head and said she did not wish to marry. "Why is this?" said her father. "Some of these young men are rich, handsome, and brave." "Why should I marry?" replied the girl. "My father and mother take care of me. Our lodge is good; the parfleches are never empty; there are plenty of tanned robes and soft furs for winter. Why trouble me, then?" Soon after, the Raven Bearers held a dance. They all painted themselves nicely and wore their finest ornaments and each one tried to dance the best. Afterward some of them asked for this girl, but she said, "No." After that the Bulls, the Kit-Foxes, and others of the All Comrades held their dances, and many men who were rich and some great warriors asked this man for his daughter, but to every one she said, "No." "Ah!" replied her father; "it must always be as he says"; and they spoke no more about it. There was a poor young man. He was very poor. His father, his mother, and all his relations were dead. He had no lodge, no wife to tan his robes or make his moccasins. His clothes were always old and worn. He had no home. To-day he stopped in one lodge; then to-morrow he ate and slept in another. Thus he lived. He had a good face, but on his cheek was a bad scar. After they had held those dances, some of the young men met this poor Scarface, and they laughed at him and said, "Why do not you ask that girl to marry you? You are so rich and handsome." Scarface did not laugh. He looked at them and said, "I will do as you say; I will go and ask her." All the young men thought this was funny; they laughed a good deal at Scarface as he was walking away. Scarface went down by the river and waited there, near the place where the women went to get water. By and by the girl came there. Scarface spoke to her, and said, "Girl, stop; I want to speak with you. I do not wish to do anything secretly, but I speak to you here openly, where the Sun looks down and all may see." "I have seen the days," said Scarface. "I have seen how you have refused all those men, who are young and rich and brave. To-day some of these young men laughed and said to me, 'Why do not you ask her?' I am poor. I have no lodge, no food, no clothes, no robes. I have no relations. All of them have died. Yet now to-day I say to you, take pity. Be my wife." The girl hid her face in her robe and brushed the ground with the point of her moccasin, back and forth, back and forth, for she was thinking. After a time she spoke and said, "It is true I have refused all those rich young men; yet now a poor one asks me, and I am glad. I will be your wife, and my people will be glad. You are poor, but that does not matter. My father will give you dogs; my mother will make us a lodge; my relations will give us robes and furs; you will no longer be poor." Then the young man was glad, and he started forward to kiss her, but she put out her hand and held him back, and said, "Wait; the Sun has spoken to me. He said I may not marry; that I belong to him; that if I listen to him I shall live to great age. So now I say, go to the Sun; say to him, 'She whom you spoke with has listened to your words; she has never done wrong, but now she wants to marry. I want her for my wife.' Ask him to take that scar from your face; that will be his sign, and I shall know he is pleased. But if he refuses, or if you cannot find his lodge, then do not return to me." "Oh!" cried Scarface; "at first your words were good. I was glad. But now it is dark. My heart is dead. Where is that far-off lodge? Where is the trail that no one yet has travelled?" "Take courage, take courage," said the girl softly, and she went on to her lodge. Scarface was very unhappy. He did not know what to do. He sat down and covered his face with his robe, and tried to think. At length he stood up and went to an old woman who had been kind to him, and said to her, "Pity me. I am very poor. I am going away, on a long journey. Make me some moccasins." "Where are you going—far from the camp?" asked the old woman. "I do not know where I am going," he replied; "I am in trouble, but I cannot talk about it." This old woman had a kind heart. She made him moccasins—seven pairs; and gave him also a sack of food—pemican, dried meat, and back fat. All alone, and with a sad heart, Scarface climbed the bluff that overlooked the valley, and when he had reached the top, turned to look back at the camp. He wondered if he should ever see it again; if he should return to the girl and to the people. "Pity me, O Sun!" he prayed; and turning away, he set off to look for the trail to the Sun's lodge. For many days he went on. He crossed great prairies and followed up timbered rivers, and crossed the mountains. Every day his sack of food grew lighter, but as he went along he looked for berries and roots, and sometimes he killed an animal. These things gave him food. One night he came to the home of a wolf. "Hah!" said the wolf; "what are you doing so far from your home?" "I am looking for the place where the Sun lives," replied Scarface. "I have been sent to speak with him." "I have travelled over much country," said the wolf; "I know all the prairies, the valleys, and the mountains; but I have never seen the Sun's home. But wait a moment. I know a person who is very wise, and who may be able to tell you the road. Ask the bear." The next day Scarface went on again, stopping now and then to rest and to pick berries, and when night came he was at the bear's lodge. "Where is your home?" asked the bear. "Why are you travelling so far alone?" "Ah," replied the man, "I have come to you for help. Pity me. Because of what that girl said to me, I am looking for the Sun. I wish to ask him for her." "I do not know where he lives," said the bear. "I have travelled by many rivers and I know the mountains, yet I have not seen his lodge. Farther on there is some one—that striped face—who knows a great deal; ask him." When the young man got there, the badger was in his hole. But Scarface called to him, "Oh, cunning striped face! I wish to speak with you." The badger put his head out of the hole and said, "What do you want, my brother?" "I wish to find the Sun's home," said Scarface. "I wish to speak with him." "I do not know where he lives," answered the badger. "I never travel very far. Over there in the timber is the wolverene. He is always travelling about, and knows many things. Perhaps he can tell you." Scarface went over to the forest and looked all about for the wolverene, but could not see him; so he sat down on a log to rest. "Alas, alas!" he cried; "wolverene, take pity on me. My food is gone, my moccasins are worn out; I fear I shall die." Some one close to him said, "What is it, my brother?" and looking around, he saw the wolverene sitting there. "She whom I wish to marry belongs to the Sun," said Scarface; "I am trying to find where he lives, so that I may ask him for her." "Ah," said the wolverene, "I know where he lives. It is nearly night now, but to-morrow I will show you the trail to the big water. He lives on the other side of it." Early in the morning they set out, and the wolverene showed Scarface the trail, and he followed it until he came to the water's edge. When he looked out over it, his heart almost stopped. Never before had any one seen such a great water. The other side could not be seen and there was no end to it. Scarface sat down on the shore. This seemed the end. His food was gone; his moccasins were worn out; he had no longer strength, no longer courage; his heart was sick. "I cannot cross this great water," he said. "I cannot return to the people. Here by this water I shall die." Yet, even as he thought this, helpers were near. Two swans came swimming up to the shore and said to him, "Why have you come here? What are you doing? It is very far to the place where your people live." "I have come here to die," replied Scarface. "Far away in my country is a beautiful girl. I want to marry her, but she belongs to the Sun; so I set out to find him and ask him for her. I have travelled many days. My food is gone. I cannot go back; I cannot cross this great water; so I must die." "No," said the swans; "it shall not be so. Across this water is the home of that Above Person. Get on our backs, and we will take you there." Scarface stood up. Now he felt strong and full of courage. He waded out into the water and lay down on the swans' backs, and they swam away. It was a fearful journey, for that water was deep and black, and in it live strange people and great animals which might reach up and seize a person and pull him down under the water; yet the swans carried Scarface safely to the other side. There was seen a broad, hard trail leading back from the water's edge. "There," said the swans; "you are now close to the Sun's lodge. Follow that trail, and soon you will see it." Scarface started to walk along the trail, and after he had gone a little way he came to some beautiful things lying in the trail. There was a war shirt, a shield, a bow, and a quiver of arrows. He had never seen such fine weapons. He looked at them, but he did not touch them, and at last walked around them and went on. A little farther along he met a young man, a very handsome person. 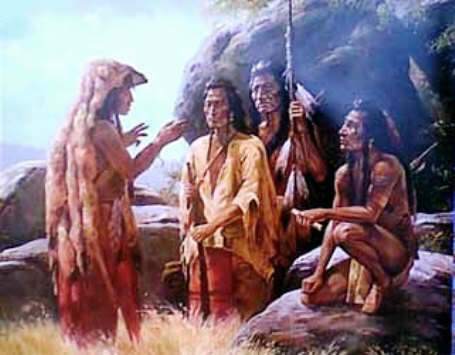 His hair was long; his clothing was made of strange skins, and his moccasins were sewed with bright feathers. The young man spoke to him and asked, "Did you see some weapons lying in the trail?" "Yes," replied Scarf ace, "I saw them." "No," said Scarface; "I supposed some one had left them there, and I did not touch them." "You do not meddle with the property of others," said the young man. "What is your name, and where are you going?" Scarface told him. Then said the young man, "My name is Early Riser (the morning star). The Sun is my father. Come, I will take you to our lodge. My father is not at home now, but he will return at night." At length they came to the lodge. It was large and handsome, and on it were painted strange medicine animals. On a tripod behind the lodge were the Sun's weapons and his war clothing. Scarface was ashamed to go into the lodge, but Morning Star said, "Friend, do not be afraid; we are glad you have come." When they went in a woman was sitting there, the Moon, the Sun's wife and the mother of Morning Star. She spoke to Scarface kindly and gave him food to eat, and when he had eaten she asked, "Why have you come so far from your people?" So Scarface told her about the beautiful girl that he wished to marry and said, "She belongs to the Sun. I have come to ask him for her." When it was almost night, and time for the Sun to come home, the Moon hid Scarf ace under a pile of robes. As soon as the Sun got to the doorway he said, "A strange person is here." "Yes, father," said Morning Star, "a young man has come to see you. He is a good young man, for he found some of my things in the trail and did not touch them." Scarface came out from under the robes and the Sun entered the lodge and sat down. He spoke to Scarface and said, "I am glad you have come to our lodge. Stay with us as long as you like. Sometimes my son is lonely. Be his friend." The next day the two young men were talking about going hunting and the Moon spoke to Scarface and said, "Go with my son where you like, but do not hunt near that big water. Do not let him go there. That is the home of great birds with long, sharp bills. They kill people. I have had many sons, but these birds have killed them all. Only Morning Star is left." Scarf ace stayed a long time in the Sun's lodge, and every day went hunting with Morning Star. One day they came near the water and saw the big birds. "Come on," said Morning Star, "let us go and kill those birds." "No, no," said Scarface, "we must not go there. Those are terrible birds; they will kill us." Morning Star would not listen. He ran toward the water and Scarface ran after him, for he knew that he must kill the birds and save the boy's life. He ran ahead of Morning Star and met the birds, which were coming to fight, and killed every one of them with his spear; not one was left. The young men cut off the heads of the birds and carried them home, and when Morning Star's mother heard what they had done, and they showed her the birds' heads, she was glad. She cried over the two young men and called Scarface "My son," and when the Sun came home at night she told him about it, and he too was glad. "My son," he said to Scarface, "I will not forget what you have this day done for me. Tell me now what I can do for you; what is your trouble?" "Alas, alas!" replied Scarface, "Pity me. I came here to ask you for that girl. I want to marry her. I asked her and she was glad, but she says that she belongs to you, and that you told her not to marry." "What you say is true," replied the Sun. "I have seen the days and all that she has done. Now I give her to you. She is yours. I am glad that she has been wise, and I know that she has never done wrong. The Sun takes care of good women; they shall live a long time, and so shall their husbands and children. "Now, soon you will go home. I wish to tell you something and you must be wise and listen. I am the only chief; everything is mine; I made the earth, the mountains, the prairies, the rivers, and the forests; I made the people and all the animals. This is why I say that I alone am chief. I can never die. It is true the winter makes me old and weak, but every summer I grow young again. "What one of all the animals is the smartest?" the Sun went on. "It is the raven, for he always finds food; he is never hungry. Which one of all the animals is the most to be reverenced? It is the buffalo; of all the animals I like him best. He is for the people; he is your food and your shelter. What part of his body is sacred? It is the tongue; that belongs to me. What else is sacred? Berries. They too are mine. Come with me now and see the world." The Sun took Scarface to the edge of the sky and they looked down and saw the world. It is flat and round, and all around the edge it goes straight down. Then said the Sun, "If any man is sick or in danger his wife may promise to build me a lodge if he recovers. If the woman is good, then I shall be pleased and help the man; but if she is not good, or if she lies, then I shall be angry. You shall build the lodge like the world, round, with walls, but first you must build a sweat-lodge of one hundred sticks. It shall be arched like the sky, and one-half of it shall be painted red for me, the other half you shall paint black for the night." He told Scar-f ace all about making the Medicine Lodge, and when he had finished speaking, he rubbed some medicine on the young man's face and the scar that had been there disappeared. He gave him two raven feathers, saying: "These are a sign for the girl that I give her to you. They must always be worn by the husband of the woman who builds a Medicine Lodge." Now Scarface was ready to return home. The Sun and Morning Star gave him many good presents; the Moon cried and kissed him and was sorry to see him go. Then the Sun showed him the short trail. It was the Wolf Road—the Milky Way. He followed it and soon reached the ground. It was a very hot day. All the lodge skins were raised and the people sat in the shade. There was a chief, a very generous man, who all day long was calling out for feasts, and people kept coming to his lodge to eat and smoke with him. Early in the morning this chief saw sitting on a butte near by a person close-wrapped in his robe. All day long this person sat there and did not move. When it was almost night the chief said, "That person has sat there all day in the strong heat, and he has not eaten nor drunk. Perhaps he is a stranger. Go and ask him to come to my lodge." Some young men ran up to the person and said to him, "Why have you sat here all day in the great heat? Come to the shade of the lodges. The chief asks you to eat with him." The person rose and threw off his robe and the young men were surprised. He wore fine clothing; his bow, shield, and other weapons were of strange make; but they knew his face, although the scar was gone, and they ran ahead, shouting, "The Scarface poor young man has come. He is poor no longer. The scar on his face is gone." All the people hurried out to see him and to ask him questions. "Where did you get all these fine things?" He did not answer. There in the crowd stood that young woman, and, taking the two raven feathers from his head, he gave them to her and said, "The trail was long and I nearly died, but by those helpers I found his lodge. He is glad. He sends these feathers to you. They are the sign." Great was her gladness then. They were married and made the first Medicine Lodge, as the Sun had said. The Sun was glad. He gave them great age. They were never sick. When they were very old, one morning their children called to them, "Awake, rise and eat." They did not move. In the night, together, in sleep, without pain, their shadows had departed to the Sandhills.